I've recently added lots of new products to my skincare routine so I thought it was time for another New Skincare Additions post. La Roche Posay Toleriane Dermo Cleanser*- This is an intriguing product. It's a lotion like cleanser that removes makeup while being extremely gentle and suitable for the most sensitive of skins. I'm loving the texture because it's very light but I have yet to test its abilities to remove a full face of makeup. La Roche Posay Toleriane Ultra*- From the same range is their moisturiser. It's quite an intense moisturiser but it's light enough to wear during the day. I've been using this on days when my skin is quite irritated and this immediately soothes it and calms everything down. Vichy IDEALIA Skin Sleep- This little sample size came with an order from Escentual I believe and again, my interest was piqued. The range is designed to repair dull skin overnight. Having dry skin often means it looks dull, so a product like this is right up my street. Una Brennan Rose Hydrate Mask- If you saw my Everything's Rosy post, then you'll already know I added this to my routine. I'll be posting my review next week but for now, let's just say, it's good. It's really good! 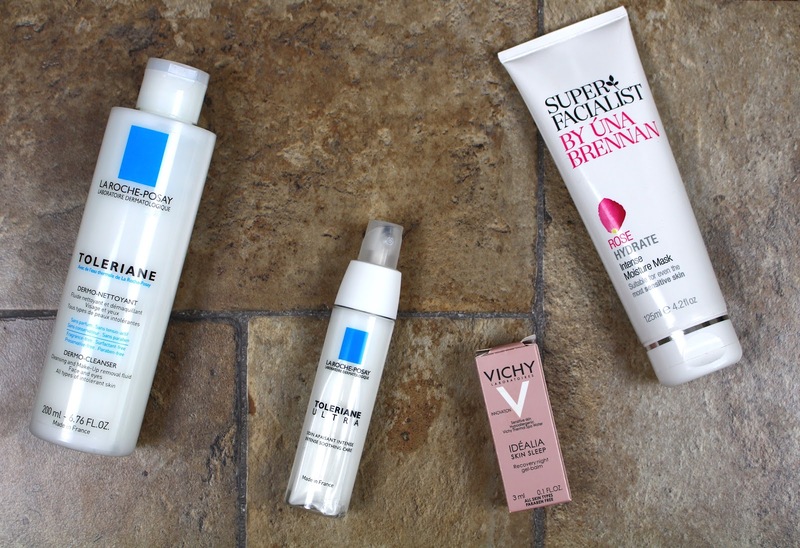 So those are my latest skincare additions! Expect to see reviews on these products very soon!